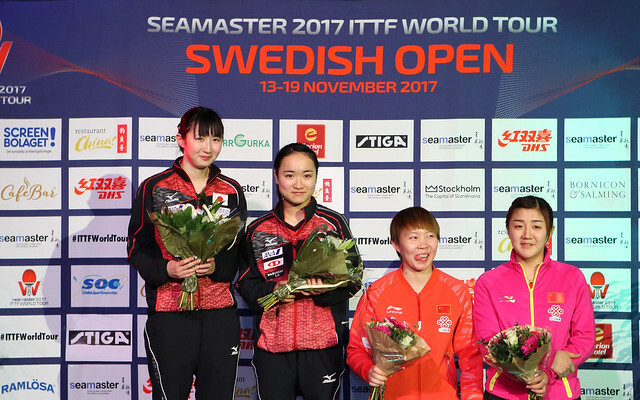 Experienced, now 38 years old, Jens Lundqvist shone for the host nation, as play in the Men’s Singles event at the qualification tournament for the Seamaster 2017 ITTF World Tour Swedish Open in Stockholm came to a close on the late afternoon of Wednesday 15th November. He beat Portugal’s João Monteiro by the narrowest of margins in a full distance five games contest (6-11, 3-11, 11-7, 11-5, 11-7, 10-12, 11-9). However, he was the only Swede to negotiate the second preliminary round; the major disappointment being the comprehensive defeat of Pär Gerell by Kazakhstan’s Kirill Gerassimenko (11-8, 11-6, 12-10, 11-8). A performance of note by Kirill Gerassimenko but as the latter stages of the qualification tournament came to a conclusion, he was not the only player to catch the eye. The Czech Republic’s Pavel Sirucek very much led the line. He accounted for Korea’s Jeoung Youngsik (9-11, 11-5, 11-13, 11-5, 7-11, 11-8, 11-8); equally imposing Slovenia’s Darko Jorgic overcame China’s Liang Jingkun (11-8, 4-11, 8-11, 11-9, 11-5, 12-10). Jeoung Youngsik is returning to international action after an enforced break owing to a wrist injury but most notably has ITTF World Tour Men’s Singles titles to his name. Two years ago in 2015 he won on home soil in Incheon and also in Australia. Meanwhile, although Liang Jingkun may have no such accolades to his name; last year he ended the schedule as one of the leading players in the prestigious China Super League. Likewise, there was a most impressive performance from Denmark’s Zhai Yujia who beat England’s Paul Drinkhall (5-11, 6-11, 14-12, 11-4, 9-11, 11-6, 11-4) , as there was from Nigeria’s Quadri Aruna who flew the flag for Africa. He overcame Hong Kong’s Ho Kwan Kit, like Jeoung Youngsik an ITTF World Tour Men’s Singles winner. He won in 2014 in the Philippines. Quadri Aruna prevailed in six games (11-9, 6-11, 11-5, 8-11, 15-13, 11-4). Noteworthy efforts, likewise the performances of China’s Zhou Yu and Japan’s Masataka Morizono should not be overlooked. Masataka Morizono beat India’s Sharath Kamal Achanta (12-10, 13-11, 11-4, 11-9), Zhou Yu ended the hopes of Austria’s Robert Gardos (7-11, 11-7, 11-8, 13-11, 11-7).